Homemade bread is a wonderful thing to make and to keep around the house, but there are several things that keep us from baking bread as often as we might like. The first thing is time. It can take a couple of hours to take a loaf from start to finish and, while we might have time on the weekends, this rules it out for weekdays. The second thing is difficulty. Kneading bread can seem like a daunting task to novice bakers, and even experienced bakers don’t always want to get the counter covered with flour. This No Knead Whole Wheat Honey Sandwich Bread is one of the easiest breads I’ve ever made and it is darn tasty. It requires no kneading and has a very short rising time, so the bread can be fully baked just about one hour after you start to mix the ingredients together! The secret to this bread is the temperature of the ingredients used. 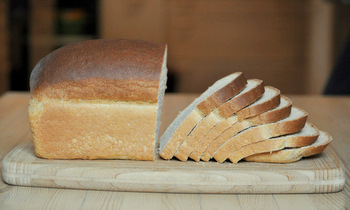 It uses both bread flour (you can use all purpose, but bread flour gives you a slightly better texture in the finished loaf) and whole wheat flour, which gives the bread a great structure and a good wheat flavor. The flour is warmed before adding it to the rest of the ingredients, and all that heat kick starts the yeast into a rapid rise and cuts the total rising time to just 30 minutes! The bread also does all of its rising right in the loaf pan that it is baked in. You don’t need to knead the dough before putting it into the pan, just stir it very vigorously when you are incorporating all of the ingredients. If you have a stand mixer, you can mix your dough with a dough hook and transfer it directly to the loaf pan. If you don’t mind a little kneading, you can turn the bread onto a lightly floured surface and knead it for just 1 minute to smooth it out even more before putting it into the loaf pan. I usually do the little bit of extra kneading, but it definitely isn’t necessary if you just put a little bit of muscle into your mixing. The finished bread is a great sandwich loaf. It has a good whole wheat flavor to it and just a hint of sweetness from the honey. It slices easily, toasts well and makes fantastic sandwiches. You can eat it while it is still warm, if you want to serve it for dinner, but it is best after it has cooled completely. You can use whole wheat flour or white whole wheat flour in this bread and you’ll get good results both ways, but a little bit lighter flavor from the white whole wheat if you prefer a slightly less hearty whole wheat flavor. In a large, microwave-safe bowl, whisk together whole wheat flour and bread flour. Microwave for 30-40 seconds, until flour is very warm to the touch. In a large bowl, or the bowl of a stand mixer, combine 1 cup of the water with the yeast and honey. Stir and let stand for 5-10 minutes, until yeast is foamy. Add in the remaining water, vegetable oil, salt and about half of the warm flour mixture and stir well with a wooden spoon to combine. If using a stand mixer, attach a dough hook and continue adding flour with the mixer on medium. Add flour gradually until dough comes together into a smooth ball and pulls away from the sides. A small amount of flour might be left over. Turn speed up to medium and mix for 1 minute. If mixing by hand, gradually add in the remaining flour, mixing vigorously with a wooden spoon with each addition. Mix until until dough comes together into a smooth ball and pulls away from the sides. A small amount of flour might be left over. Continue to push dough around with the wooden spoon for 1 additional minute after dough comes together smoothly. Lightly grease a 9×5-inch loaf pan. Turn dough into the loaf pan and cover with a piece of plastic wrap. Allow to rise for 30-35 minutes, until dough rises 1-inch above the sides of the pan. Once bread has risen, remove plastic wrap and place loaf pan in the oven. Bake for 30-35 minutes, until bread is dark golden brown. Cool in pan for 10 minutes, then turn out onto a wire rack to cool completely. Thank you, thank you! The timing on this couldn’t be better! We’re in the process of selling our house, and they suggest baking cookies or bread to make the house smell inviting. I just don’t have a warm spot where I can leave a bowl of my usual no-knead bread to rise for 18-20 hours out of site of potential buyers. I’ve been baking quick breads, but can’t wait to give this a try! Oops, that should be sight, not site!! I will definitely make this bread. I have used the 24 hour no need bread recipe floating around the internet and it was very good, but it stunk that I had to wait an entire day. This recipe sounds perfect. I can’t wait to try it. I do have a question for you. Well, actually two questions. First, what do you use to grease your loaf pan? Iâ€™m just curious. Second, how in the heck do you get such perfect bread slices? Every time I try, I butcher the poor loaf. Even with a new and very sharp serrated bread knife. Any tips would be greatly appreciated. 🙂 Thanks for the recipe. Awesome! I always tell myself I need to make bread. After all, there are few things better than fresh bread, but you nailed it with the time involved. It’s a daunting, seemingly never ending task. Not that I go looking too often, but I think this is the first sandwich style bread I have seen that’s this easy and quick and better yet, it makes only one loaf, another rarity it seems. This is definitely something I’m going to try. Tracy- I used vegetable oil to grease my loaf pan. Nonstick cooking spray would work, too. As for the slices, I just let the bread completely cool and then used a very sharp bread knife! 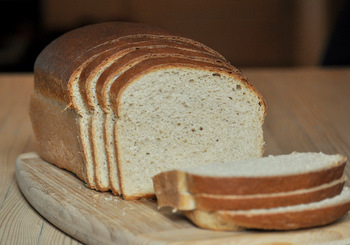 The loaf is pretty easy to slice, as if is nicely moist but not too soft/squishy. looks awesome! would there be any alterations for high altitude? This is on my baking list for tomorrow! Were supposed to get snow so this yummmmmy bread and some hot soup will be perfect! Just made this. It is not totally cool yet, but I just had to slice into it and try it. It’s awesome. Good taste. Good texture too, not something you always get in no knead breads. And so fast. I think this is my new go to recipe for sandwich bread. Thanks so much! I bake a lot of my own bread at home but sometimes I just don’t feel up to babysitting a loaf, so will try yours! Just made this bread and it is the best loaf of bread I’ve ever made! Granted I don’t make alot, but it’s easy and tastes great! I make bread every week and am constantly trying new recipes. I bookmarked this recipe for this week’s loaf, and it is now going permanently into my rotation – it’s so incredibly good and FAST. Wow – I think I have a new favorite! I used my stand mixer and basically put the wet ingredients in the bowl, then dumped the warmed flour and salt on top and mixed with the dough hook for a minute or two. I couldn’t believe that it went from mixer bowl to cooling rack in an hour. Thanks for this recipe – it’s a keeper! Made this bread today it was AWESOME! I have never seen bread rise so fast. It was fast, easy and delicous. Thank you for a great recipe. I am a bit late to this show! I need to make my own bread for the next few weeks because I am on a low iodine, no dairy, no eggs, no soy diet for some testing…I was so exited when I saw your recipe!!! 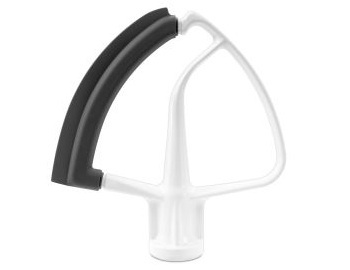 I can’t knead bread due to upper body issues, but I do have a dough hook for my mixer. I have whole wheat pastry flour and bread flour. Do you think WWP flour will work instead of WW? Also, I have regular yeast in the 1/4 oz packs and instant quick-rise in the 1/4 oz packs. Can I use either? Thanks so much for this post!!! You are a life-saver! Just made this and can’t stop eating it! I only had whole wheat pastry flour-not regular WW…it turned out good anyways. Only thing is the dough became very gooey after being ok s oI added a little more flour. Then the finished crust was totally poc-marked like the moon’s surface! It is delicious, just not pretty! Do you know what I did wrong? I was wondering if you’be ever made up double or triple batches and stored this in the fridge? Baking off loaves az you need them? I’ve tried several other “bread in five” recipes and my family prefers your recipe by far! I have a large family though, and we end up baking up a loaf every day or two! KayLee – Thanks! And this is a good question. I have not tried that with this recipe, but because it only needs a fast rise, I don’t think that this dough would be the best choice to hold in the refrigerator for several days. It’s probably best mixed and baked as you need it. What a fantastic recipe that worked on the first try! I have allergies to dairy and soy and this was ideal not only with ingredients, but for my busy family. Thanks so much and God bless! My bread rose beautifully then collapsed the minute I took off the plastic wrap to put it into the oven. Can anyone suggest how to avoid this from happening? It resulted in a very messy top and a fairly dense loaf. Is there any way of doubling this recipe?? I tried it and now I am in love with this recipe!!!! Delicious! Easy! This recipe was exactly what I was looking for. I converted the measurements to grams but found I needed a bunch of extra flour. I used instant yeast and used 3/4 tsp per 1 tsp of active dry. Used buckwheat honey cause it seemed a natural match. Ate half the loaf with my wife like little piggies. If your loaf collapsed when you took off the plastic, it is likely the plastic caught on the dough and you accidentally ‘punched down’ your loaf. Try greasing the top of your loaf next time before placing plastic on it, or even using a damp cloth instead. You just have to be very careful when pulling off plastic on these fast rising breads! Wow. I am sooo glad i decided to try this recipe! This bread is perfect sandwich bread. I had previously been using my bread machine and kept getting loaves that were VERY dense. This loaf turned out perfect and will be the recipe i use from here on out! Honestly, this bread is better then any proffessionally baked breads I’ve ever tasted. The texture is perfect and it is just perfectly moist. The smell is delicious and sweet. My husbnd and kids beg me to make this recipe almost every week. Thanks so much. This is definately a keeper. I’ve just started to try to make my own bread. Of all the sandwich bread recipes that I’ve tried this is by far the yummiest and the best. The only problem I have is that I can’t get a round top. The dough collapses when I uncover it, every time. I’ve tried putting on a wet cloth, greasing the top of the bread, and greasing the plastic wrap. We still it it cuz it’s so delicious but falls apart when we try to cut the uneven fallen over top (and because of the shape I can’t fit it in the bread slicer either). Any suggestions? Will it work If I decrease the yeast amount and let it rise longer? I can’t believe I haven’t found this recipe sooner. My husband and I love this bread! We have actually stopped buying bread at the store. The only problem I have is that the bread is really crumbly. My husband loves peanut butter and toast, and he isn’t able to put the bread in the toaster. Any suggestion will be wonderful. Thank you so much for this recipe! Just pulled this loaf out of the oven. There is a lot I like about this bread. First, the crust, and crumb have a wonderful flavor. Second, it is very forgiving. I decreased yeast and baked it 24 hours later. Third, it is just the right amount of dough that fits my 13″ Pullman loaf pan. Very well done! Thank you. My bread overflowed the 9×5 Pyrex pan. It also came out lumpy and full of dimples and craters. I am a first time bread maker and thought a no knead recipe would be best to start with. It is nice dark golden and smells good but looks like the surface of the moon! lol what did I do wrong? April – I’m sorry to hear about your results. This bread reaches a nice size, however it should not overflow a pan like that! I suspect that your bread may have over-risen, or that the pan was slightly too small. I find that some Pyrex pans are a bit smaller than advertised, so you might want to double check your measurements to be on the safe side (I have several that are actually 8.5 x 4.5-inches, and shallower than my metal pans). Best of luck with the next batch! I hope you give it another try! Once A Week Cooking, miniMOMist Style!